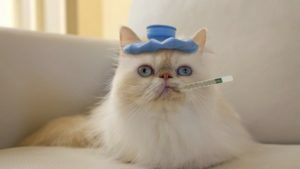 Feline Pancreatitis – How serious is inflammation of the Pancreas in cats? Inflammation of the pancreas (pancreatitis) is increasingly diagnosed in cats in recent years. It is a painful and potentially a lethal disease. The pancreas is a hormone (Insulin) producing organ. It also produces digestive enzymes (Lipase and Amylase) which are released into the intestine to facilitate digestion of food. The reasons for pancreatitis are unknown yet, but many factors are suggested to be involved. In cats, consuming of fatty meals and bacterial infection are the most likely reasons. Inflammation of the pancreas causes the digestive enzymes to leak into the blood system and damage the other organs. Organ damage might end up in multi-organ dysfunction and death. A blood test which detects those digestive enzymes in the blood is the first step of diagnosis of the condition. For cats with early stage pancreatitis, they may develop little or no signs of the disease. Alternatively, they may display obvious signs of infection such as vomiting or diarrhea; it really depends on the severity of the disease. Odd behaviour that you notice just once or twice, such as vomiting or diarrhoea, may be a simple problem or it could be the sign of something much more serious going on. Either way, it’s best to speak to your veterinarian at Canberra Veterinary Hospital.